The Plane belongs to the genus Bindahara of which this species is the only representative in Singapore. It is very rare and local in distribution, found mainly in a small area at the forest edge of the Central Catchment Nature Reserves. Some prominent physical features of the Plane are the long hindwing tails (2 cm or longer) and pendulous tornal lobe on the hindwing. 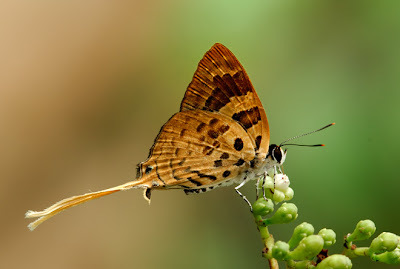 The male of this species is a deep blackish brown above with the apical area of the forewing dusted brownish red. There is a narrow blue marginal line above vein 4 on the hindwing in some individuals. The female is reddish brown with a large black spot in space 2 of the whitened tornal area of the hindwing. The undersides of the males are ochreous buff, with darker brown bands on the forewings, and spots on the hindwings. There are black tornal spots on the lobes and spaces 1b and 2 on the hindwing are overlaid with metallic green scaling. The long tails of the males are yellow. 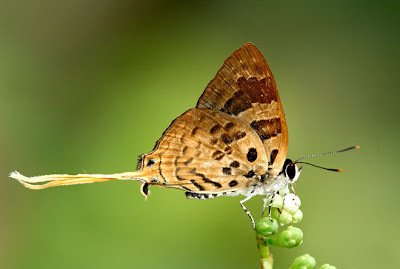 Females feature whitish ground colour on the undersides, with similar marking as in the males, with the apical areas of the forewings a light orange-brown. The tails of the females are white. Both sexes have orange tipped antennae, and large jet black eyes. 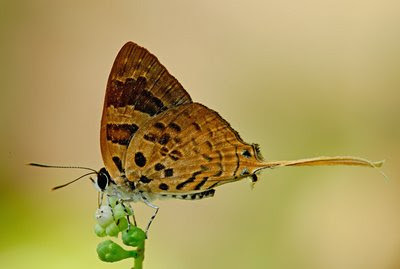 The adult butterfly has a wingspan of about 40mm. The Plane can be observed in the late morning on sunny days, either feeding on the flowers of flowering trees like the Syzygium spp., and the forest bush Leea indica of which many of these photos feature, or just flitting amongst the tall leaves of bushes and trees in the nature reserves. In Singapore, males are more often encountered than females. The Caterpillars of this species are basically white with areas of yellow and pink, but they have dark brown tubercles on each segment each bearing a black hair. The Caterpillars grow to a length of about 2 cms. They feed on the seeds within the fruit of Salacia chinensis and Salacia disepala. The Caterpillars bore into the bark of the tree to pupate. The pupa is brown and rough, with patches of white and dark brown. Its length is about 1 cm. When disturbed, the pupa emits clicking noises.